Discussion in 'SXS Radios' started by Kymedic, Mar 13, 2016. Comes programmed with all 22 frs / gmrs frequencies and also all 7 Noaa weather channels. Includes radio,mic,mounting bracket, power wire, tuned uhf antenna and coax with pl259 connector and L bracket mount for the antenna. All this for $250 shipped. For people on the west coast wanting to use the vhf frequencies, these cab be programmed with all the Rugged Radio frequencies used in the dunes. This requires a optional dual band antenna. With the dual band antenna and programming these are $300 shipped. Thats a great radio and a great deal! Just added this to my wish list, I didn't even realize I needed this so badly until I seen it! These make the ride much safer and much more fun. .
Can somebody give me a heads-up on these radios. I know nothing about these higher wattage units. We have the .5 watt models with a 20 mile line of sight range.... yeah, right, ... more like 1/2 mile on the trail. With these, is the range any better? Are there monitored emergency channels, like the old CB REACT system? What are the "rugged" channels? Any "Radios For Dummies" type info would be much appreciated. Thanks in advance for any input. @Kymedic would be a better person to answer your questions but I can give you my observations. First off, I don't have this radio (but may soon! ), I have a 50W VHF mounted in my RZR along with an intercom. With 50W and roof-top mounted antenna, the range is indeed greater, but (in my experience) NOT 10 X better than a 5W hand-held. If you are in VHF mode, there is "supposed" to a monitored channel, but again, in my experience, everyone monitors a pre-agreed upon channel. The Rugged channels are a set of VHF channels commonly used by west coast desert riding guys, especially in some of the bigger races like the Baha, Reno to Vegas, King of the Hammers, etc. One group that I ride with more often (east coast) will pick one of these channels (frequency) at the beginning of a ride and pretty much stick with it for several days unless there is some interference or some other group comes along and picks the same channel (very rare!) VHF is more commonly used in the marine environment but usually different channels so there are not too many VHF'ers out in the woods. I found some groups that liked the UHF band better (usually the FRS frequencies) so I got some UHF hand helds that worked with my VHF cords and plugs. Later, I got a few dual band (VHF/UHF) hand helds and found that we could loan them out to other riders in the group and everybody could get on the same frequency, VHF or UHF. Handy! My guess is that for the upcoming HM rally, most folks will have UHF (FRS) capabilities. A couple of years ago on PRC, I tried to generate some interest in some sort of standards for us UTV riders. It went no where! The VHF guys all wanted VHF, the UHF guys all wanted UHF, the CB guys all wanted CB, and HAM guys all wanted HAM, in other words, no one wanted to switch from what they were most familiar with. This is getting way too wordy, so I'll cut it short. IMO, an intercom (IC) is just as valuable as a 2-way radio. With a VOX (voice activated) IC not only can you talk to everyone in your buggy without shouting (think helmets) but you can feed all the headsets with music that automatically cuts off when someone speaks - no buttons to push. If you hook up your 2-way to IC also, everybody gets to hear the radio traffic between the different buggies in the group, and the driver and co driver can both talk to others in the group by pushing a remote Push To Talk (PTT) button. Not covered here are VHF vs UHF, license requirements (now that's an interesting topic! ), costs, options (a ton of 'em), wiring requirements, antenna tuning, and others I can't think of off hand. Long story short, get you one! Fswan did a great job. These have a true range of 5-7 miles on uhf in the mountains. They come standard programmed to the 22 frs / gmrs frequencies and also all 7 Noaa weather channels. These will also handle the vhf frequencies used by Rugged but require a different antenna which i do have also. Most people on the east coast use uhf. West coast uses vhf. Reason for this is uhf works better in wooded areas as the wavelength is much shorter. I bought my 50 w uhf radio from Kymedic! It seems to be a great radio for a great price! Yes they are. Love these little radios. O yeah much better range and convenience than the hand held radios. Arizona Flying Dutchman likes this. Had this one from KyMedic in my Teryx. Worked great! Would highly recommend th is guy for a Radio. 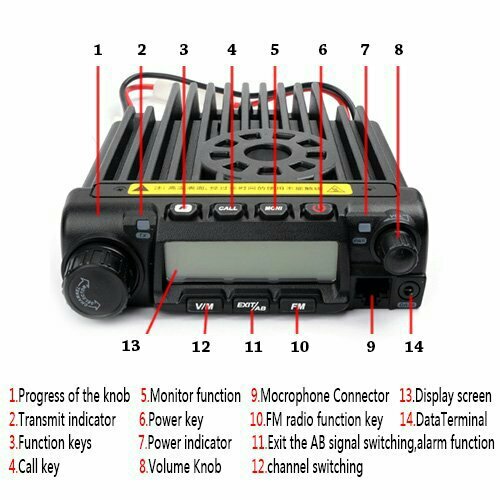 Where can i go to get further information and ordering on this radio? Send a Pm to @Kymedic. I have two of the 50w radios and know several others and they work great. I used my handheld 8w I got from @Kymedic and there is a world of difference in range compared to the Walmart radios. I was running toward the middle of the pack on a recent ride and seemed to be the break point in terms of stopping to wait for the back crew. I frequently radio'd forward to @Dave and back to @Curt with no issues at all….crystal clear. I would estimate a gap between machines of at least a few miles at times and there was no sign of any signal loss. These radios are a GREAT investment and can really make riding in a group that much more fun when you can stay in touch! Hey, I'm interested in a radio for my sxs. Looking at the TYT - TH8600. Are they on FRS, GMRS, Ham or what? Do I need a license to operate it? I was checking to find more info on those radios and see what else was out there. I went on a ham site and saw that model spoken very poorly of. In fact, they were saying it required a license, were being sold/operated illegally without a license and such. Could someone please clarify what the story is with these? Is this still a live thread? Maybe @Kymedic can elaborate. I know that the FRS channels that most of us use are technically limited to .5w. Most of the radios we use may be a little more than that. Most of these radios have to be programmed to run on whatever channels you want to run. Mine came w/ all the FRS pre set/ programmed. Not sure why the HAM guys would be upset about a few guys using the FRS channels in the woods at a higher power....but who knows. I am not a radio expert, I just like to keep in touch with the pack when on bigger rides. If you buy one other places they do not come programmed. They are capable of uhf vhf and ham channels. Ham operates are very protective of their channels and you never want to operate on a Ham frequency or commercial bands. That being said. All ours come programmed to the frs gmrs channels used in the hand held walkie talkies sold at Walmart and cabelas etc. and also the NOAA weather channels. To be 100% legal you can get your gmrs license from the FCC. It costs $70 and is good for 10 years and covers everyone in your house. Combine our most popular 25w waterproof model with the all new audio interrupter for the best of both worlds. Listen to your music and when 2way radio traffic is detected itll mute your radio and play the 2way traffic across your speakers. 2 versions available with more on their way. Waterproof kit is $230 with everything needed to install including a no ground plane antenna that can be mounted to any surface. Audio interrupters start at $59.95 and $69.95 depending on which model. 2lstews and Seastacker like this.